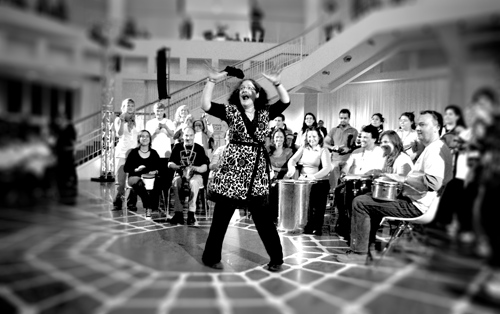 Out of all ArtBeat's collaborations the project which has generated most interest so far has been the award-winning community drumming group, 'The Buddy Beat'. Founded to promote social inclusion among mental health service users, this joins up opportunities for engagement from acute in-patient care, all the way to the community. Now in its 10th year, this award-winning drumming group for mental health service users goes from strength to strength. Scottish Chamber Orchestra – ‘Reconnect’ Project –now in its 5th year. Jane has been principal trainer and workshop leader – working alongside musicians from the orchestra to create music with people with dementia in hospital. Vox Liminis – ‘In Tune’: Working in three Scottish prisons, piloting and developing family music making sessions with imprisoned parents, their children, and their primary carers. NHS Renfrewshire Mental Health Services: Jane has an ongoing engagement with the NHS - bringing music throughout the wards in the Royal Alexandra Hospital and Dykebar Hospital, Paisley: ranging from rehab and recovery, to older adult mental health services. Asian Rhythm Facilitators Conference, Kuala Lumpur, 2016, keynote speaker and two-day ‘Therapeutic Rhythm Communication’ course. Scottish Chamber Orchestra – training for ‘Reconnect’ project for people in hospital with dementia. Interfaith Scotland - workshops at conferences, national launches, and youth events using music making as a tool to examine diversity, communication, and collaboration. Margaret McLarty's new album, 'Brigid's Birds'.